Meredith Alvarez, RDN of Abundant Wellness & Nutrition is the featured guest this month. 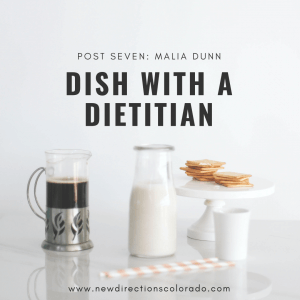 Responding to questions about disordered eating & eating disorders. This post discusses: helping you sift through a variety of trendy foods our culture encourages us to eat while prioritizing recovery from an eating disorder. Karlee Golightly, RD, RYT of Moxie Mind is the featured guest this month. Responding to questions about disordered eating & eating disorders. This post discusses: exercise addiction and how to shift to joyful movement along with tips on nutrition to keep your body fueled with exercise. Katie Faber, RD of Revival Nutrition is the featured guest this month. Responding to questions about disordered eating & eating disorders. This post discusses: food addiction and other nutrition facts versus fables. Malia Dunn, RD, CEDRD of Essential Nutrition is the featured guest this month. Responding to questions about disordered eating & eating disorders. This post discusses: weight watchers plus how to select the dietitian that is right for you. Jamie Magdic, RDN of Your Happy Healthy is the featured guest this month. Responding to questions about disordered eating & eating disorders. This post discusses: eating disorder recovery during holidays – food and movement plus alternatives to weight-focused New Year’s Resolutions. Hannah Turnbull, RD of Nourished With Hannah is the featured guest this month. Responding to questions about disordered eating & eating disorders. This post discusses: set-point theory with respect to weight & body size, HAES (Health at Every Size™) concepts and myth busting “willpower”.